How to maintains the mattress? Please remove the plastic packaging before use. During normal use of your new mattress, you may notice slight body impressions. These impressions commonly occur because the mattress is adjusting to the contours of your body. (Body impressions are not product defects). Turn over the mattress every two weeks in the first three months and turn it over every two to three months afterwards. 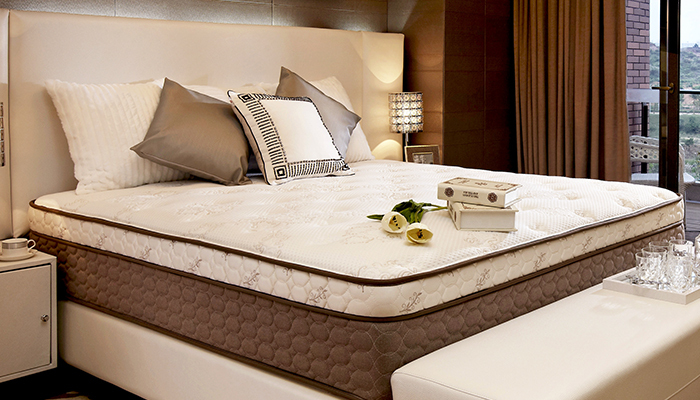 This action can ensure even wear and prolong the life of the mattress by equalizing the impression left by your body. The only recommended cleaning method is to vacuum the mattress to remove dust and mites. If anything spills and stains the mattress, use a mixture of mild soap with cold water or upholstery cleaner to clean the mattress. Apply water sparingly. Be sure not to soak the mattress with water or any other fluid. Avoid all chemicals as these can seriously damage the mattress and could have a negative effect on health. An excellent way to protect a mattress is to complement it with a mattress pad. Since mattress pad can be taken off easily for ventilation to eliminate bad smell, it prolongs the life of a mattress, makes it more hygienic and also makes the bed easier to make. Don't bend your mattress nor jump on it under any circumstances. Such treatment may damage the innerspring nuit. Use an appropriate foundation. An old or inappropriate foundation unit may not provide proper support and cause sagging gradually. Don't turn mattress by yourself individually. It may damage to your mattress and cause you injured.